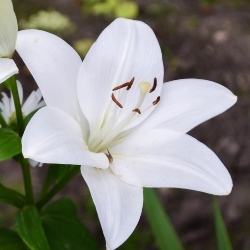 Hybrid Lilies can be grown almost anywhere, including wild gardens, woodlands, among shrubs and herbaceous borders. They are also excellent cut flowers and ideal for pots. When cutting, be sure to leave one-third of the stem to ensure the bulbs will survive for years. Asiatic varieties have showy, upright facing blooms with 4-8 buds per stem. 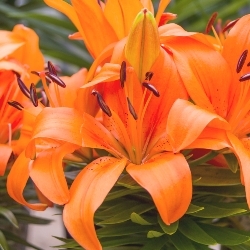 Asiatic Lilies have 4-8 showy upright-facing flowers per stem. Asiatic Lilies are regal carefree flowers that are easy to grow and produce outstanding color for early summer gardens. For Fall Shipped Asiatic Lilies please click here. Many flowers on a single stem. Great for cutting. 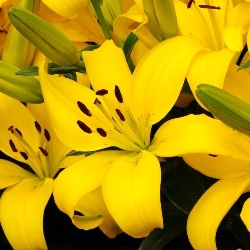 Our selection of Asiatic Lilies contains 10 each of the following: Yellow, Orange and White. Individually packaged and labeled. Easy to grow - you can expect to see blooms over a four week period with this mixture. Our assortment of Asiatic Lilies by the Bushel contain a mixture of early and late blooming varieties. Lilies are regal carefree flowers that are easy to grow and produce outstanding color for early summer gardens. Interplant them among your Spring-flowering bulbs to hide the dying foliage and fill in the flowering gap between spring and summer blooming plants. One bushel (approximately 300 bulbs) will cover an average of 160 sq. ft.
For Fall Planted Bushels of Asiatic Lilies please click here.